People who suffer neck pain usually experience restless sleep. They also feel hard to fall asleep every night. The long lack of sleep can lead to many health issues. But, does pillow relate to neck pain? Yes, it is the one of the reasons for neck pain. With that being said, this buying guide is going to minimize the chances of experiencing neck pain and relieving the neck pain by choosing the right pillow. Our list has top 10 best pillows for neck pain. They come in different materials, designs and prices. If you are stomach sleepers, you need a low loft pillow that helps your spine to stay in alignment with your back. This type needs the lowest pillow of three. If you are a back sleeper, you need a moderate loft pillow toward the back and more contour toward the front of the pillow. If you are side sleeper, you will feel more supportive when sleeping on the fairly high loft pillow. Choosing the pillow that has heightened contour from your ear to the base of your neck is the way to the comfort. Of all three types of sleeper, side sleepers need the highest. What We should Consider When Choosing a Best Pillows for Neck Pain? Choosing the fill – Pillows comes in a variety of materials. Each type has its pros and cons. It is no materials coming as the best fill for neck pain. It just depends on your preference. If the material is memory foam, the greater choice should be the shredded memory foam. This type usually allows you to adjust the fill as your desire by adding or removing some amount of the fill. Hence, you are easy to find your right comfort and support. Furthermore, when memory foam is shredded into smaller pieces, it allows air to flow through the pillow easily. This results in greater breathability for the pillow. Along with shredded memory foam, buckwheat pillows are also popular. They are also easy to adjust the fill for the right firmness and thickness. They are good to mold to the shape of the head as well. However, you may experience a bit noise issue when you make movements during your sleep. How about goose down? Usually gooses down pillows are more expensive. However, they also have some pros. They are light in weight. And, in comparison with memory foam, goose down is less likely to absorb and retain heat. Hence, it can be cooler than memory foam pillows. Choosing the design – Pillows comes in many different designs. To be better support for neck pain suffers or avoid neck pain, the orthopedic designs are good to choose. They are designed to keep you’re the alignment between your head and your body in proper way. If you like the memory foam pillows, but they do not comes with shredded memory foam fills? The greater options should be those that come with different thickness ends. The lower end is usually used for back sleepers, whereas, the thicker end is good for side sleepers. Obviously, there are plenty options when it comes to choosing a best pillow. But, things are different when it is a best pillow for neck pain. We need more than high quality materials and reasonable prices. 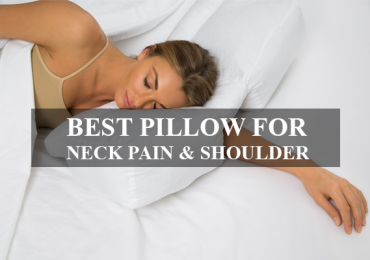 With the following top 10 best pillows for neck support, all of them are hand-picked, which the features are carefully considered to be best for those with pain in the neck. Coop Home Goods is a trusted company when it comes to shopping best pillows. Their products are well-known for smart design. This just means about their adjustable fill that allows adding or removing as user’s preference. To discover more, let’s see as below. The fill – the pillow is filled with the proprietary mix of visco elastic memory foam. What’s more? It is made in USA, CertiPUR-US certified, and shredded. Especially, it can be adjustable to fit your preferred firmness. If it is too fluffy, you can easily take out some of fill to make it just your right thickness. The cover – The cover fabric is constructed from a unique blend of 60% Polyester, 40% Rayon Derived from Bamboo. This blend makes it very thick, soft and super breathable. There is also a gusseted cover for greater edge support. In addition, the outer cover is hypoallergenic and machine washable as well. The pillow is fairly soft, which comes about 3 out of 10 on the firmness scale if 10 is the firmest level. When you put your head down on it, it will be conforming to your head nicely and let you feel the comfort and support. If you sleeping on your side, the pillow just allows your head to rest evenly in line with your back. Also, it just fills the empty space between the neck and the head if you are a back sleeper. Especially, it allows you to adjust your preferred thickness by taking out some of the fill, so you can feel the comfort and support. The memory foam is shredded, which allows the air to flow through the pillow easily. This feature eliminates the fear of warm feel when using. If you purchase this pillow, the Coop Home Goods Company will offer you a 5-year warranty. 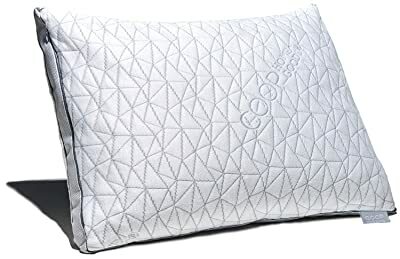 If you are looking for the best pillows that allows you to add or remove the fill as your liking, this Eden pillow is the next recommendation coming from Coop Home Goods. Actually, along with adjustable fill, the pillow is packed with many great features. let’s see more! The fill – It is filled with gel-infused memory foam and a special blend of premium combed microfiber. In addition, the memory foam is shredded into cross-cut pieces, which is aimed to make it easily ventilated. Along with that, this design helps prevent the fill from clumping together. Furthermore, it is infused with cooling gel, which helps draw out heat and keep you at a comfortable temperature throughout the night. Especially, it allows you to add, move or remove to adjust your preferred thickness and firmness easily. The cover – the inner cover is made of 100% polyester, whereas, the outer cover is made of a blend of 40% Bamboo Derived Rayon 60% Polyester. The inner cover is durable and breathable, whereas, the outer cover is thick, soft and breathable. That means, along with providing extra softness, it offers the cooling feel during the night for sleepers. In addition, the cover is designed with the zipper allowing you to easily add or remove as much of it as you need to meet your own unique needs. The gusseted design prevents pillow pinch (when the edges of your pillow slope together and fill gets pushed out from under your neck). Lastly, both the inner pillow and removable cover are machine washable. This Eden pillow is soft, which comes around 3 out of 10 on the firmness scale, if 10 is rated as the firmest level. It can cradle your head and neck nicely, and then it let your feel supportive. The shredded memory foam just does a good job in providing the contour. 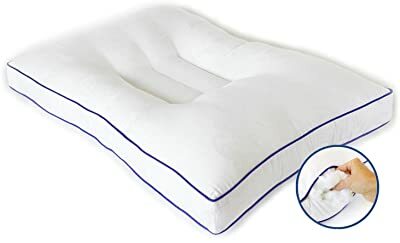 However, many side sleepers complain that this pillow aren’t supportive enough for them due to less fluffy feel, whereas, back and stomach sleepers can feel supper good to rest their heads on it. There is a big compliment on the cooling feel perspective for this Eden pillow. The memory foam is infused with cooling gel that helps eliminate heat retention. Along with that, it is shredded into cross-cut pieces. This helps a lot in improving breathability. More ideally, if you purchase this pillow but don’t feel content with the feels of Eden pillow, you are allowed to return it within 100 days. This is called a trial period. In addition, it comes in three sizes: Standard (20”x26”), Queen (20”x30”) or King (20”x36”), which offers you more options when it comes to choosing a best pillow for your bed. The following recommendation is a Nest Easy Breather pillow. The most outstanding feature it has is the adjustable fill that allow you to add, or remove some amount of stuffing. What else? Let’s see the below details! 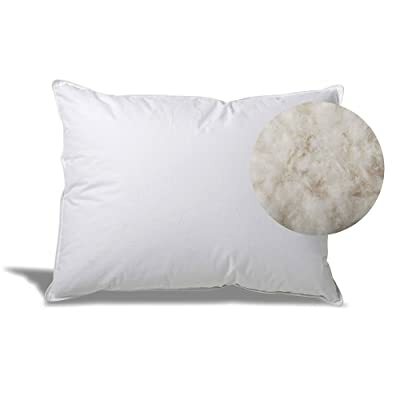 The fill – this Nest Easy Breather pillow is filled with shredded memory foam. The original shape of standard size comes in 8 inches in thickness. It can be also adjusted the thickness to your liking by removing, or adding some amount of stuffing. In addition, when using the shredded memory foam for the fill, it is better at letting air to flow through the pillow easily. The cover – the fabric used for making the outer cover is a breathable type. It is also soft but thick. In addition, it comes with a zipper that allows you to adjust the fill inside easily. This memory foam used has a bit bouncy feel. It can response to pressure slowly, which means it will contour pleasantly to your neck for some immediate comfort and relief. Along with that, it has the necessary softness but never let your head sunk far down into the pillow. Hence, sleepers can feel more comfy and supportive. If you sleep on your back, the pillow just keep your head up and in a great alignment with your spine. If your sleep on side, the pillow just helps fill in the space at your neck super well. If you are stomach sleeper, you can feel more supportive after taking out some amount of stuffing. To help the pillow well ventilated, it comes with shredded memory foam. The air can flow through the pillow easily. Along with that, the fabric used for the cover does help improve the breathability. Nest Easy Breather pillow is made in USA and it comes in three size including: Standard, Queen and King sizes. If you are more into the feels of goose down pillow, this eLuxurySupply Goose Down Pillow is worth your consideration. What is else about this great pillow? The fill – The eLuxurySupply goose down pillow is filled with 600 fill power that consists of 80% Down – 20% Feather filling. Fill power is a measure of how “fluffy” a down pillow is. Higher fill power means higher loft / fluffiness. The description of “600 fill power” in this pillow creates medium – medium high loft. 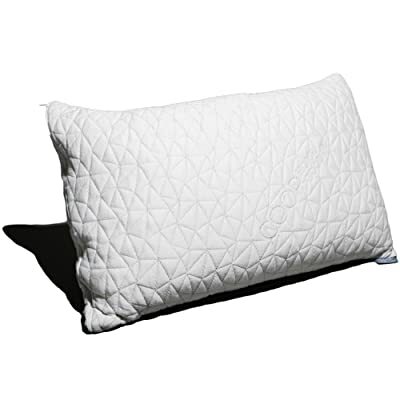 The cover – This pillow is encased in a 230 thread count, 100% cotton cover. As the feel perspective, the cotton fabric makes it soft and breathable. Aesthetically, it just looks basic and simple in its white tone. The initial feel you will experience when you head is rested on it is the great softness. The sinkage it creates is pronounced. But, it has the great amount of support. Especially, the pillow reacts to your movements and contours to your new position nicely. As recommendations, back and side sleeper will feel great when sleep on it, whereas, stomach sleepers may feel less supportive. Unlike memory foam, goose down is less likely to absorb and retain heat. It can provide cooling feel by itself without any cooling gel solutions. Additionally, the cotton fabric used for the cover is good at wicking moisture away and keeping the pillow ventilated. If where the pillow is made in makes sense when it comes to choosing a best pillow, this eLuxurySupply Goose Down Pillow comes from USA. Having adjustable fill is always good when it comes to choosing a best pillow for neck support. You can add or remove some amount of the fill by yourself, and the just enjoy the right comfort. For those who are looking for a pillow like this, Snuggle-Pedic Ultra-Luxury Bamboo Pillow is a great choice. Furthermore, you are also offered great customer policies. Let’s see as below. 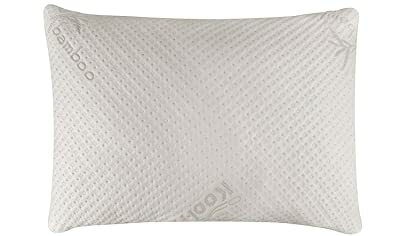 The fill – the Snuggle-Pedic Ultra-Luxury Bamboo Pillow is filled with shredded memory foam. When foam is shredded into smaller pieces, it allows to be added or removed some amount of the fill easily. And then, you can find your right comfort and support. Along with that, it helps air to flow through the pillow easily. The cover – the fabric used for the cover is constructed from a blend of polyester and bamboo. Due to giving great softness, good breathability, the fabric is also completely hypoallergenic. The pillow is fairly firm, which comes around 7.5 out of 10 on the firmness scale if 10 is the firmest level. However, it can provide cuddling feel your head and let your head sunk a bit into it. And bear in mind that, the fill is adjustable. You can added some amount of the fill if you feel it is still thin to your taste, or you can remove some amount of the fill to make it thinner. In general, the pillow is good at keeping cool during the night. The shredded memory foam can allow air to flow through the pillow easily. Hence, sleepers can feel worry-free for heat retention. In addition, the bamboo cover just does a good job in providing breathability. 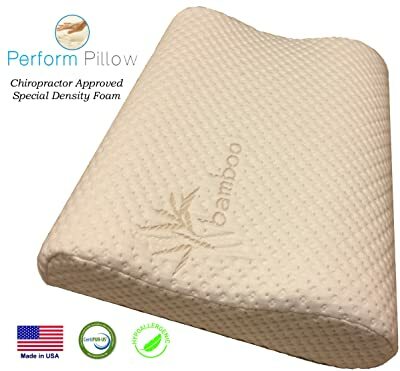 There is good customer policies coming from Relief-Mart™ Company when you buy this Snuggle-Pedic Ultra-Luxury Bamboo Pillow, it is a 20-year warranty and 120-day trial period. If you feel disappointed with it, just return it directly to the company. It is shipping-free and also hassle-free. Side sleepers are advised to use the pillows that have higher loft, so that, they can have heightened contour from their ear to the base of their neck. It is claimed that this pillow is targeted to side sleepers, so, if you are looking a best pillow for side sleeper, here are the details of the pillow. The fill – the pillow is filled with memory foam. It is also shredded, which allows you to add or remove some amount of the fill as your liking, and then you have your right comfort and support. Additionally, the memory foam has been certified by internationally renowned CertiPUR-US. This means it contains no harmful chemical substances. The cover – the fabric used is constructed from a blend of 60% polyester, 40% rayon derived from bamboo. Due to this unique blend, it is fairly soft and breathable. Along with that, it comes with natural fabric woven in a perforated design that allows it to be super breathable. In addition, it also comes with Zipper that allows you to take out or add some amount of the fill easily. Lastly, it is completely washable. You can easily the feel the nice softness of the pillow right after you rest your head on it. The pillow will let your head sunk down into it a bit. But, this pillow is also designed to be firm enough so that you won’t be stuck in there. In addition, the pillow can mold itself to my head easily and provides support for your neck. More ideally, the fill is designed to be adjustable, allowing you to achieve a balance between fluffiness and firmness. There is no treatment for memory foam as the way to minimize heat retention, but the pillow does a good job in keeping cool. Plus, the fabric used for cover does add a lot in providing cool feel to the pillow. This pillow is manufactured by Sunvalley Brands. When you buy this pillow, Sunvalley Brands will offer you 30-Day Money Back Guarantee & Lifetime Limited Product Warranty. The most outstanding feature of Nature’s Guest Cervical Support Pillow is its orthopedic design. This makes it better to support your head and neck. Also, it is helpful a lot in providing neck pain relief. What else? 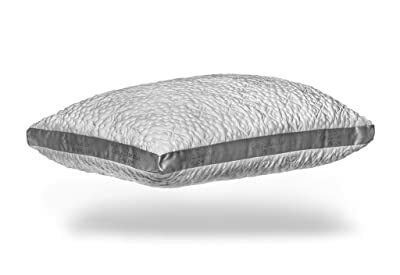 The fill – Nature’s Guest Cervical Support Pillow is filled with memory foam, but it is uniquely designed with the gusseted edge. This design makes it better at providing support the neck and the head. In addition, the fill also allows you to add or remove some amount of the fill, so that you can adjust the firmness and thickness to your right comfort and support. The cover – it is a premium cotton fabric cover and revolutionary microfiber support filling provides cool, comfortable support. The cover comes with two zippers on the sides that help you easier to adjust the fill when needed. Due to the unique design, it is supportive to all types of sleeper. It has the indentation in the middle, which helps to maintain the alignment of head and neck in a proper way. In addition, the pillow allows you to adjust the firmness from soft – medium, which helps fit all types of sleepers easily. Along with that, the gusseted edge does help provide additional support. The memory foam does absorb and retain heat, but in general the pillow does a good job in minimizing the heat retention. If you buy this pillow but don’t feel satisfied after experiencing, Integrity Global allows you to return it back and get your refund within 90 days. How about a pillow that can fit the needs of different sleepers? It is very convenient, right? 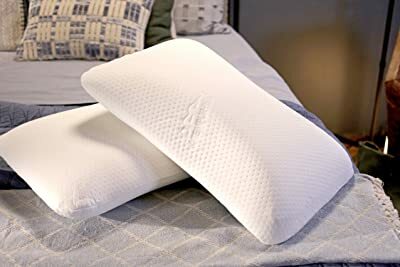 If you are one of those who look for a pillow like this, especially, if you are side or back sleepers, the Tempur-Pedic TEMPUR-Symphony Pillow would be a great choice. The cover – it is 100% polyester knit cover. In general, the fabric is fairly soft to touch and breathable. Along with that, it is also washable. The pillow is not too firm or too soft, which is just right to feel comfortable. Your head will be also sinking into it a bit, yet not going to be stuck. The contour and sinkage levels are just moderate. More ideally, it can response to your movements slowly. In general, it is fairly good at keeping the pillow cool all night long. Hence, there its no need to worry about warm feel. The additional information that you may need to know about this pillow include: the pillow is made in USA, it has 5-year warranty and no return policy. 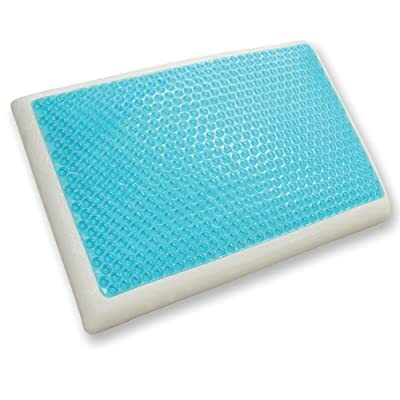 Classic Brands Reversible Cool Gel Pillow stands out from the crowd by its own way. It has two different designs for two sides, one comes with cooling gel and the other has only memory foam. Let’s see more! 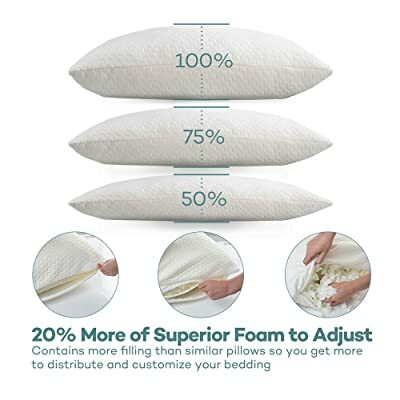 The fill – Classic Brands Reversible Cool Gel and Memory Foam Pillow is filled with memory foam coming in 5 inches of loft. The memory foam has open-cell structure that is aimed to get air flow easily. Especially, you are no need to flip over the pillow to find your cooling side because one side of this pillow comes with cooling gel. This makes it more unique. The cover – the fabric looks fairly thin and simple. It is a mesh knit cover that is breathable and soft to feel. The pillows can response to the pressure easily. When you rest your head on it, it will immediately mold to your head’s shape, and let your feel supportive. In terms of firmness, it is firm enough to prevent your head from sinking too far, but not too firm to cause discomfort or pain in the neck when you wake up in the next morning. That means the firmness is just about medium level. There is no need to doubt about the cooling feel of this pillow. The cooling gel side works great in keeping cool all night long. Along with that, the memory foam used is designed with open-cell structure and the cover is fairly thin, which helps a lot in providing breathability. The pillow also comes with 3-year warranty when your purchase it. Along with that, if any disappointments happen, you are allowed to return within 30 days. If you buy this pillow from Amazon, you can return it through Amazon Returns directly. The last recommendation included in this list is about Medium Profile Memory Foam Neck Pillow. It has unique design that is aim to support all types of sleepers. Below are the clearer details! The fill – it is constructed from Special Density Foam and it comes with Orthopedic Design. That means one end has lower loft than the other end. In addition, the foam used is also tested to be harmful chemical-free and low in VOC. The cover – the fabric is constructed from a blend of 56% Polyester and 43% Bamboo. It is thick to be durable and soft to be nice to feel. Along with that, it is removable and washable, making it more ideal for cleaning and hygiene tasks. Due to the unique design, people with different sleeping positions are easy to find the end that provide them comfort and support. If you are a side sleeper, using the thicker end would be recommended. This way helps your shoulder your shoulder will tuck under the pillow slightly and provide the best support. Consequentially, you feel fully supportive all night long and feel neck-pain free the next morning, whereas, if you are back sleeper, resting your head on the lower end may work. Aside from uniquely smart design, this pillow is also not too firm or too soft. The firmness is just moderate for pronounced contour, yet not stuck feel. The memory foam is a high density type that is more likely to absorb and retain heat than lower density types. Plus, there is no solution to treat heat retention. This pillow does produce warm feel a bit, but it comes at bearable level. If you are wondering how tall each end is, the lower end is 3 inches in height, whereas, the thicker end is 4.5 inches in height. When it comes to choosing the best pillows for neck pain, they should be supportive, but not sacrifice the comfort. And, the right one would be the pillow that you can feel comfortable all night long and wake up feeling pain-free. Lastly, bear in mind that, to help you reduce the pain in the neck or have a good preventive measure for neck pain, a good pillow should well coordinate with a best mattress.